It was a good day for Laurent Koscielny and Arsenal as they beat Chelsea 2-0 at Emirates Stadium to close the gap on the fourth-placed Blues to three points. Alexandre Lacazette put Arsenal ahead with a brilliant finish inside the near post in the 14th minute before Koscielny doubled the hosts’ head six minutes before half-time when he mistimed a header but saw the ball loop in off his shoulder. 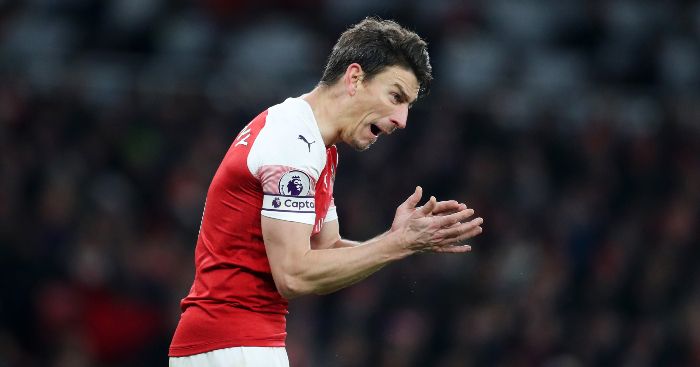 Chelsea pressed for a way back into the game in the second half, but Koscielny in particular was excellent in repelling their threat, not least when he stood firm to block a goalbound shot – but not in a way he would want to repeat. Try not to wince as you watch.